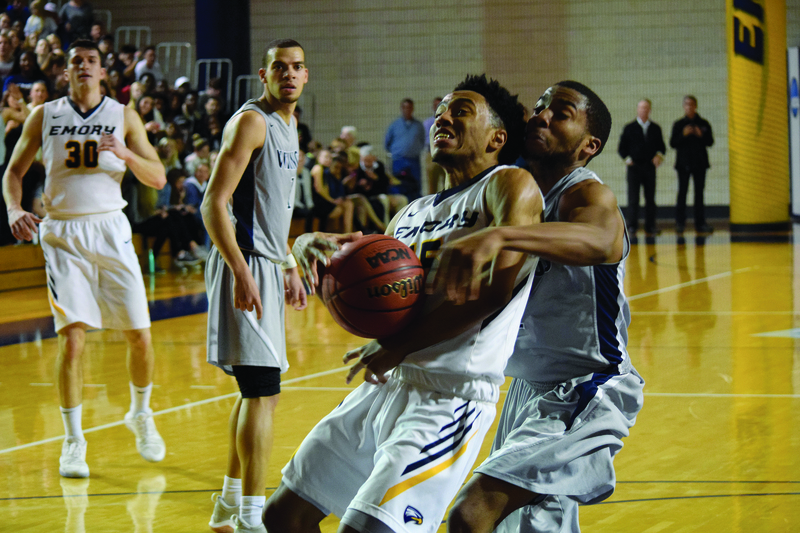 The Emory men’s basketball team advanced to the Sweet 16 after the Eagles stomped Berry College (Ga.) 91-72 on March 2 and narrowly escaped LeTourneau University (Texas) 83-82 on March 3 during the opening two rounds of the NCAA Division III Tournament hosted at the Woodruff P.E. Center. The Eagles held their first matchup against the Berry Vikings in a game largely determined by a massive second-half run. Freshman guard Romin Williams achieved a game-high 25 points on eight-of-16 shooting, which led a quartet of Eagles in double-figure scoring. Senior forward Christopher Avant contributed 16 points and a team-high six rebounds, while senior guard Whit Rapp added 14 points and eight assists that night. Junior guard Gebereal Baitey rounded out the group with 12 points. From the onset, the Eagles established themselves offensively and led the entire first half. Leading 24-19 with 9 minutes and 56 seconds remaining in the first, the Eagles went on a 13-4 run. Following a pair of converted free throws, the Eagles scored through an Avant jumper, a Rapp layup and a three by senior forward Adam Gigax, bringing their advantage to 37-23. In the second half, the Vikings claimed their first lead six minutes in. With 14 minutes and 20 seconds remaining, a jumper by junior forward Elijah Hirsh gave the Vikings a 54-53 advantage. But that was the only lead the Vikings held for the rest of the match. The Eagles embarked on a blistering 32-10 run that left the Vikings helpless, trailing 85-64 with 2 minutes and 53 seconds remaining. 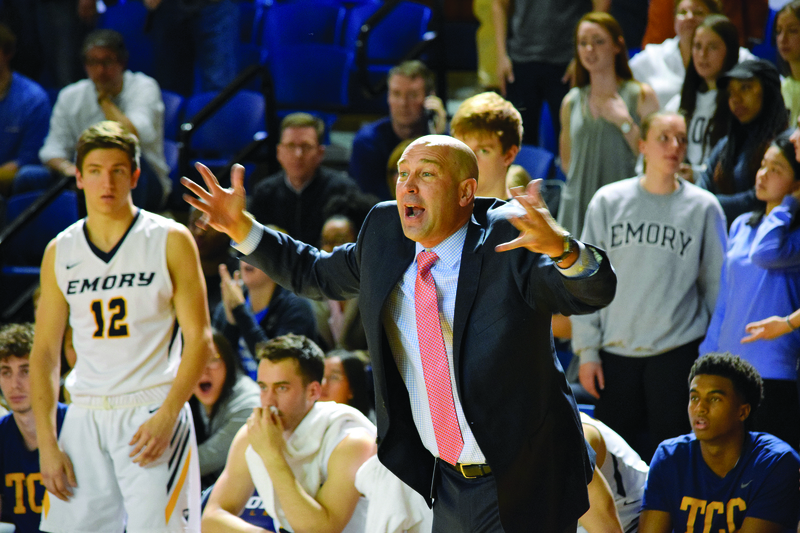 The Eagles’ defensive pressure and forced turnovers largely accounted for the Emory’s’ sudden offensive onslaught. In the second half, the Vikings endured 11 turnovers in addition to their 10 from the first period. The Eagles, on the other hand, garnered 11 total. Rapp added that the team used the crowd’s energy and channeled it into a successful run late in the second half. 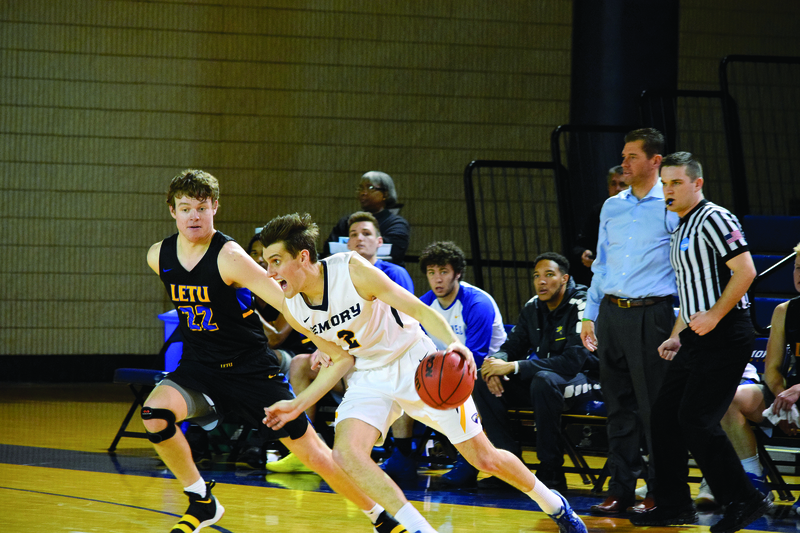 The Eagles’ second-round matchup against the LeTourneau Yellowjackets proved a stiffer challenge that was decided in the final minute. Avant led five double-digit scorers with a season-high 22 points on 9-of-17 shooting, including the biggest layup of the game. Baitey posted 15 points on 7-of-11 field goals, while Gigax contributed 14 points. Williams and junior guard Beau Bommarito added 11 and 10, respectively. Rapp added to his growing assist record by dishing out 13 dimes. Continuing their offensive prowess from the night before, the Eagles led for much of the first half. In the opening frame, Emory led by as much as 15 points, thanks in large part to duo of Baitey and Avant scoring 11 points each. With a 46-37 lead at the start of the second, the Eagles held a marginal advantage throughout much of the rest of the game. But the Yellowjackets remained within striking distance. With nine minutes left, the Yellowjackets cut the lead to three, 66-63, following a three-point jumper by sophomore guard Nate West. The Eagles responded in kind with a run of their own over the next five minutes that pushed the lead back up to eight, 79-71. West embarked on a solo-run to push LeTourneau back into the game. After a pair of Yellowjacket free throws, West converted an and-one layup and a three-pointer to narrow the deficit to 81-79. In response, Avant made a clutch layup off a beautiful ‘Rapp’-around assist from Emory’s all-time assist leader to notch the Eagles an 83-79 edge. But immediately after, West again converted a step-back three to trim Emory’s lead to just one point. Chaos ensued. With 13 seconds remaining, the referee sent Rapp to the line after a foul. On Rapp’s first try from the charity stripe, an official called Emory for a rare lane violation, resulting in a turnover on possession and a chance for the Yellowjackets to win the game. Riding the hot-hand, West hoisted a three-point attempt that didn’t fall. Rapp came away with the final rebound that sent the Eagles to the next round. With the victory, the Eagles tied their second-best ever win total of a season with 23, trailing only the 1989-1990 Emory team. The Eagles will head to Augustana College (Ill.) to face University of Wisconsin-Oshkosh on March 9 at 5:30 p.m. CST. 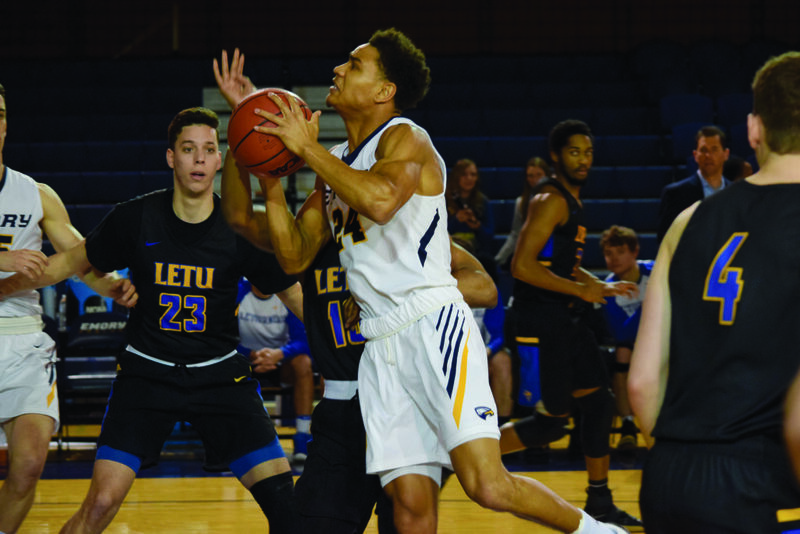 Correction (3/7/18 at 9:29 p.m.): A previous version of this article stated that, during the LeTourneau University (Texas) game, the Eagles’ lead in the last five minutes was 79-7, when in fact the score should have read 79-71. The story has been updated to reflect this fact.